AVR® 8-bit microcontrollers include several sleep modes that enable the application to shut down unused modules in the MCU, thereby saving power. The AVR device provides various sleep modes allowing you to tailor the power consumption to the application requirements. 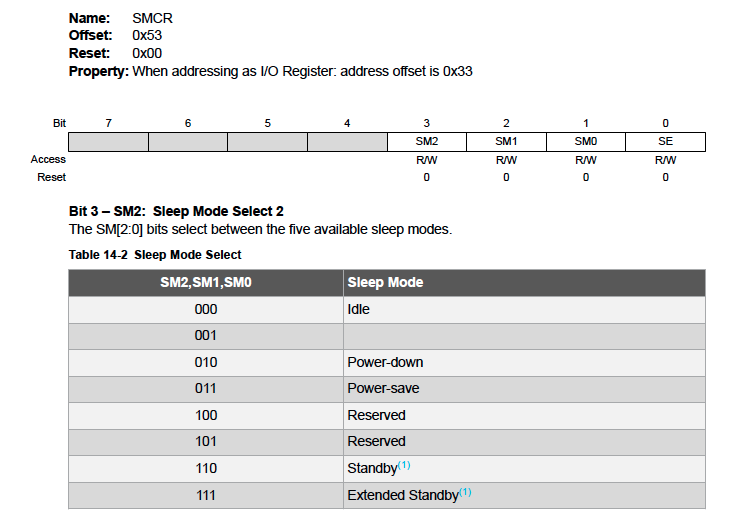 To enter any of the sleep modes, the Sleep Enable bit in the Sleep Mode Control Register (SMCR.SE) must be written to '1' and a SLEEP instruction must be executed. Sleep Mode Select bits (SMCR.SM[2:0]) select which sleep mode (Idle, Power-down, Power-save, Standby, or Extended Standby) will be activated by the SLEEP instruction. Sleep options shown are from ATmega328PB. If a reset occurs during sleep mode, the MCU wakes up and executes from the Reset Vector. When the SM[2:0] bits are written to '000', the SLEEP instruction makes the MCU enter Idle mode, stopping the CPU but allowing the Serial Peripheral Interface (SPI), Universal Synchronous/Asynchronous Receiver/Transmitter (USART), Analog Comparator, 2-wire Serial Interface, Timer/Counters, Watchdog, and the interrupt system to continue operating. This sleep mode basically halts the CPU clock (clkCPU) and Flash clock (clkFLASH), while allowing the other clocks to run. Idle mode enables the MCU to wake up from external interrupts as well as internal ones like the Timer Overflow and USART Transmit Complete interrupts. If wake-up from the Analog Comparator interrupt is not required, the Analog Comparator can be powered down by setting the ACD bit in the Analog Comparator Control and Status Register – ACSR. This will reduce power consumption in Idle mode. This sleep mode basically halts all generated clocks, allowing operation of asynchronous modules only. Note: If a level triggered interrupt is used for wake up from power down, the required level must be held long enough for the MCU to complete the wake-up to trigger the level interrupt. If the level disappears before the end of the Start-up Time, the MCU will still wake up, but no interrupt will be generated. The start-up time is defined by the Start Up Timer (SUT) and Clock Select (CKSEL) Fuses. When waking up from Power-Down mode, there is a delay from the wake-up condition occurs until the wake-up becomes effective. This allows the clock to restart and become stable after having been stopped. The wake-up period is defined by the same CKSEL Fuses that define the Reset Time-out period. When the SM[2:0] bits are written to 011, the SLEEP instruction makes the MCU enter Power-save mode. This mode is identical to Power-down, with one exception: If Timer/Counter2 is enabled, it will keep running during sleep. The device can wake up from either Timer Overflow or Output Compare event from Timer/Counter2 if the corresponding Timer/Counter2 interrupt enable bits are set in Timer Interrupt Mask Register (TIMSK2), and the Global Interrupt Enable bit in Status Register (SREG) is set. If Timer/Counter2 is not running, Power-down mode is recommended instead of Power-save mode. The Timer/Counter2 can be clocked both synchronously and asynchronously in Power-save mode. If Timer/Counter2 is not using the asynchronous clock, the Timer/Counter Oscillator is stopped during sleep. If Timer/Counter2 is not using the synchronous clock, the clock source is stopped during sleep. Even if the synchronous clock is running in Power-save, this clock is only available for Timer/Counter2. When the SM[2:0] bits are written to '110' and an external clock option is selected, the SLEEP instruction makes the MCU enter Standby mode. This mode is identical to Power-Down with the exception that the Oscillator is kept running. From Standby mode, the device wakes up in six clock cycles. When the SM[2:0] bits are written to '111' and an external clock option is selected, the SLEEP instruction makes the MCU enter Extended Standby mode. This mode is identical to Power-Save mode with the exception that the Oscillator is kept running. From Extended Standby mode, the device wakes up in six clock cycles. There are several possibilities to consider when trying to minimize the power consumption in an AVR controlled system. In general, sleep modes should be used as much as possible, and the sleep mode should be selected so that as few as possible of the device’s functions are operating. All functions not needed should be disabled. In particular, the following modules may need special consideration when trying to achieve the lowest possible power consumption. When entering Idle mode, the Analog Comparator should be disabled if not used. When entering ADC Noise Reduction mode, the Analog Comparator should be disabled. In other sleep modes, the Analog Comparator is automatically disabled. However, if the Analog Comparator is set up to use the Internal Voltage Reference as input, the Analog Comparator should be disabled in all sleep modes. Otherwise, the Internal Voltage Reference will be enabled, independent of sleep mode. If the Brown-Out Detector (BOD) is not needed by the application, this module should be turned off. If the BOD is enabled by the BODLEVEL Fuses, it will be enabled in all sleep modes, and hence, always consume power. In the deeper sleep modes, this will contribute significantly to the total current consumption. sleep mode, the output can be used immediately. When entering a sleep mode, all port pins should be configured to use minimum power. The most important is then to ensure that no pins drive resistive loads. In sleep modes where both the I/O clock (clkI/O) and the ADC clock (clkADC) are stopped, the input buffers of the device will be disabled. This ensures that no power is consumed by the input logic when not needed. In some cases, the input logic is needed for detecting wake-up conditions, and it will then be enabled. Refer to the section Digital Input Enable and Sleep Modes for details on which pins are enabled. If the input buffer is enabled and the input signal is left floating or have an analog signal level close to VCC/2, the input buffer will use excessive power. If the On-chip debug system is enabled by the DWEN Fuse and the chip enters sleep mode, the main clock source is enabled and hence always consumes power. In the deeper sleep modes, this will contribute significantly to the total current consumption.